Makizushi. this year’s EHO is “North-northwest”. Today is Setsubun, the day before the start of Spring according to the luna calendar. 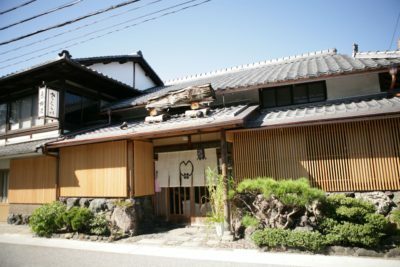 Have you tried “Mame-maki (bean-throwing)? 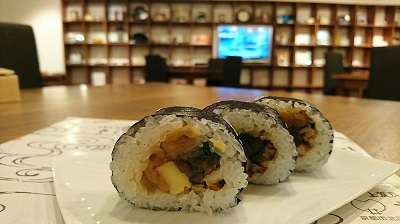 We got “makizushi(=rolled sushi)” from “Kyo-ryori Sakurai (ryoutei restaurant)”, a restaurant where our clients often use for their wedding reception. 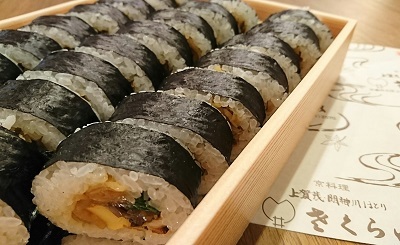 It is believed that if you eat whole makizushi while facing “EHO (=lucky direction of the year)” on Setsubun evening, happiness will be brought to you. Tomorrow is “risshun”, the first day of Spring in the Luna calendar. We will continue our best effort to make our clients’ wedding ceremonies wonderful ones for the coming Spring. Thank you for the delicious “makizushi”, Sakurai. We really appreciate your always kind consideration to us.